Wiccans can be polytheist, animist, pantheist, monist, duotheist, atheist/archetypalist, or “all of the above depending on the day”. Most Pagans believe that the divine is, or deities are, immanent in the world; and that includes most Wiccans. This theological diversity works in ritual settings as long as everyone can “translate in their head” and have a certain amount of flexibility as to practice and the wording of rituals. That’s enough apple pie metaphors… let’s get down to brass tacks. It’s good to have descriptions of what a word means, so that labels are mutually comprehensible. It’s also quite nice when the meaning of a word bears some vague resemblance to its etymology. But there’s a conflict between creating a meaning that is inclusive enough to include the majority of people who want to identify as that label, and making a word completely meaningless. A definition is a fairly precise meaning or set of meanings that are generally agreed usage(s) of a word and what it denotes. However, language usage is fluid and changeable, and different groups of people use words differently in different contexts. That’s why it is a good idea to examine the connotations of a word, so that we can describe how it is used in different contexts. Examples of words that have highly fluid — and thus highly disputed — meanings: Pagan, polytheist, and Wiccan. Part of the reason that these words are disputed is because the dictionary definitions are largely unhelpful and out of date. Why are the meanings disputed? If a group of people wants to describe its practice, beliefs, and values as distinct from those of another group, it becomes helpful to have a name that describes only that group, and is not in use by another group. This is why the various denominations of Christianity have created labels to distinguish themselves from each other. It’s why there are umpteen different varieties of witchcraft, Druidry, and Heathenry. You can recognise some common factor that makes them fit in their respective categories; but there’s enough difference between them that it is worth adding a qualifier to the label. The word “Wiccan” has a fairly chequered history. Gerald Gardner referred to all witches as “the Wica“. Charles Cardell described his group as “Wiccens“. 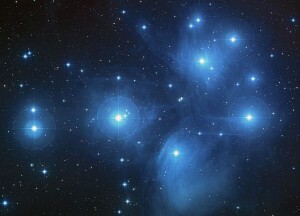 Gradually, in the USA, Wicca came to refer to any Wiccan or “Wiccanish” tradition. In the UK, it tends to refer to Gardnerian and Alexandrian Wiccans — but many people identify as Wiccan who have never been initiated into those traditions. (Part of the reason for this is that it became very difficult to identify as a witch during the late 1980s and early 1990s, and Wiccan became a handy euphemism for witch.) The word “Wicca” has become so broad and confusing that it may be impossible to restrict its meaning to Gardnerian and Alexandrian Wiccans. There are also other witchcraft traditions (in the UK, Canada, Australia, and the USA) such as the 1734 tradition, the Clan of Tubal Cain, Feri, Reclaiming, and so on. Most of them are initiatory. Fortunately, hardly anyone disputes that the word “witch” applies to all these different traditions. To my mind, polytheism just means “many gods” or “belief in many gods”. It doesn’t say anything about how you worship them, or what type of rituals you perform to get in touch with them. Some people want to define polytheism as “religious regard for many gods” (in order to exclude those who acknowledge that gods exist but don’t have any truck with them – but I think that is redundant, as even if a Christian acknowledges that our gods exist in some way, they don’t acknowledge them as gods, so their view is irrelevant to the definition of the term). If you want to describe a particular way that people interact with the gods, or a particular concept of what they are, then I would argue that you need a qualifying adjective. Various qualifying adjectives have been suggested (hard polytheism, soft polytheism, devotional polytheism, relational polytheism, Jungian or archetypalist polytheism, monistic polytheism, henotheistic polytheism, mystical polytheism), not in order to split polytheism as a whole, but to provide more accurate descriptions of how people relate to the gods. add a qualifying adjective to distinguish your usage of the term from theirs. Should you have a specific patron deity? Can you choose your patron deity, or should they choose you? Do we serve the gods, or are they allies? Can we ever know the true nature of the gods? Who has the authority to answer these questions for others? It is probably not possible to “win” one of these arguments, or answer the question to everyone’s satisfaction. But there is always someone who wants their definition of a concept to be the only valid definition, and to be a gatekeeper of who gets to identify as a particular label. Being a gatekeeper or the person who gets to define a term is a position of power and control, potentially with authority attached to it. Whoever gets to define or describe what polytheism is will have a huge influence on its future development. If it is a broad-brush movement with many different ways to be polytheist, it will become large, nebulous, and hard to control. If it is narrowly defined, it will be much smaller, but possibly easier to control. And it will end up excluding people whose insights, ideas, and practices might have been valuable to it. My own position is that I don’t want to control anything. I am inherently distrustful of authority (including any authority that I myself may accidentally have acquired). Any authority should have checks and balances with it. If you are the high priestess of a coven, or the leader of a religious tradition, there should be a process for consultation and establishing consensus, and in large groups, for democracy and accountability. For example, in the Inclusive Wicca Discussion Group that I founded on Facebook, I created a set of group guidelines and invited members to vote on them and add to them; and there is more than one moderator for the group. In my coven, we take it in turns to write rituals, so everyone gets the kind of ritual they like; and whoever has written the ritual is the facilitator for that ritual. Whilst I am the most experienced witch in the coven, so the buck does tend to stop with me, I do try to empower others. The process of teaching and learning that we use is all about sharing ideas. If you want to create a sub-tradition of polytheism that has a set of beliefs, practices, and values that meet your expectations and requirements, that’s fine. But don’t try to label it as the One True Way of polytheism. You will need to give it a more specific name. Some have argued that if polytheism is seen as a catch-all term that includes soft polytheists, archetypalists, and so on, then it becomes a less useful term. Maybe so, but that’s just how language and terminology work. That’s why Niki Whiting proposed the term ‘relational polytheism’, and others have proposed other qualifying adjectives: to be clear about how our polytheism works out in practice and in context. Similarly, there are different flavours of Wicca and witchcraft, each with their own label, to enable people to find a flavour of Wicca that’s right for them. People are confusing denotation with connotation, as often happens when the meaning of a term is contested. The term polytheism denotes ‘many gods’. To a devotional polytheist, that has connotations of devotion, religious regard, and so on. To a relational polytheist, the connotations are forming relationships with the gods. In order for different groups of people to find the polytheists they want to hang out with, we need those qualifying adjectives so that everyone who honours many gods can call themselves polytheists, without insisting on a particular definition of a god, but if you want to be more precise about how you want to honour the gods, or what you think gods are, then use a qualifying adjective. The alternative is that a tiny group of people get to define what polytheism is and who gets to call themselves polytheist, till the whole thing turns into a clique and everyone else loses interest. As Bekah Evie Bel points out, polytheism isn’t yours. And it’s not mine either. It belongs to everyone. The Brewery of the Gods! It is well known from the lore that the gods actually have a brewery, not a bakery. It’s true that Iðunn’s golden apples keep the Aesir ever-young… but on Mount Olympos, the tipple of choice is nectar and ambrosia. The devas of Hindu mythology drink Amrita, a related substance. Norse mythology tells of Aegir, the ale brewer of the gods, who held a big party for honored guests every winter. 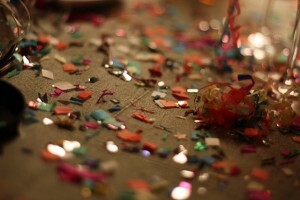 The party was held inside a great hall whose floor was littered with glittering gold, providing enough light that no fires were necessary for illumination. The special beer for the event was brewed in a giant cauldron given to him by Thor and served in magical cups that refilled as soon as they were empty. He even had a couple of loyal servants who distributed food and otherwise cared for the guests’ needs. The shindig was the highlight of the social season and all the gods attended. 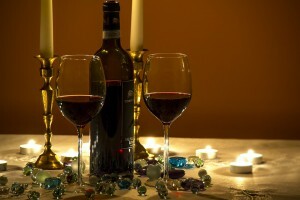 However, like so many off-campus college parties, alcohol and animosity could sometimes spoil a perfectly good evening. In Greek mythology, Bacchus was the god of wine; in Roman mythology, Dionysos had that role. 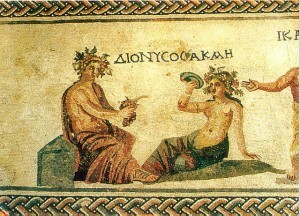 Hellenistic mosaics discovered in 1962 close to the city of Paphos depicting Dionysos, god of wine. – Photo by Georgeg, Public Domain. There was also the time when Oðinn stole the mead brewed from the blood of Kvasir from under the mountain where it had been hidden by Suttung. Alcohol was clearly important and sacred to our ancestors. It’s a shame that we merely abuse it, instead of using it in a sacred manner (like other drugs that ought to be used as a sacrament). 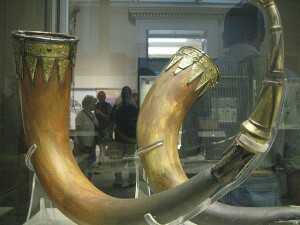 The Taplow drinking horns. Photo by unforth – Flickr.com, CC BY-SA 2.0. The brewing of alcohol seems rather magical – taking some ingredients that are not intoxicating, mixing them together, leaving them to ferment, and thereby producing a drink that can transform your perceptions – if used carefully and sparingly. It’s quite exciting to put fruit, sugar, water, and yeast in a demijohn and watch it blooping and bubbling away as it ferments. There’s nothing quite like the taste of home-made wine, especially if you gathered the ingredients yourself from the hedgerows. It’s like alchemy! Many people maintain that alcohol is sacred because it has yeast in it and has been fermented, which makes it alive somehow. If you have some form of alcoholic sacrament at the end of your ritual (cakes and wine if you’re Wiccan, or a sharing of mead if you’re a Heathen), there may be some people who are recovering alcoholics who cannot partake. Maybe you could share some other fermented drink, like drinkable yoghurt? (Personally I don’t think this is cultural appropriation unless you steal the ritual that goes with it. YMMV.) Other solutions to this that have been suggested are having a non-alcoholic alternative (but some people prefer the symbolism of everyone drinking from the same cup / horn / chalice). Alcohol is sacred and powerful, and there are many different types and flavours of alcohol available. Some people prefer mead; others prefer wine, or cider, or beer, or lager. Some people say “I don’t like beer”, but do not realise the huge variety of beers that are available. Some people call alcoholic drinks by different names – cider in the UK, hard cider in the US; ale, beer, lager, porter, stout… If you ask me what my favourite drink is, I’d have to say, all of the above, depending on the day and my mood. Religion is also sacred and powerful, and there are many different types and flavours of religion available. Some people prefer Heathenry; others prefer Wicca, or Druidry, or eclectic Paganism, or Asatru. Some people say “I don’t like religion” but don’t realise the huge variety of religious experiences that are available. And some people call religious experiences by different names – polytheism, hard polytheism, relational polytheism, devotional polytheism, pantheism, mysticism, and so on. Some people, when presented with a list of theological perspectives, will say, “all of the above, depending on the context, the day, and my mood”. As this excellent post by Bekah Evie Bel, Polytheism Isn’t Yours, points out, you could just ask people what they mean by the label they are using, instead of assuming that they mean the same by it as you do, and then being disappointed when it turns out that they don’t. So if someone shares their surface with you and they say, “I am a polytheist” try not to make any assumptions. Ask for clarification if you are interested by this surface, move on if you aren’t interested. Clarification (usually expanded labels) will tell you how much deeper you want to go. But if you don’t ask for clarification, if you don’t seek to go even a bit below the surface then it’s not that persons fault if you make a stupid assumption. Just like you read the list of ingredients on food and drink to make sure there’s nothing that you’re allergic to. Thing is, it’s in the nature of language that people will use words to mean something slightly different, or even wildly different – so labels should be used as a way to start a conversation, not as a substitute for a conversation. This post was inspired by a comment by Bekah Evie Bel on my previous post which mentioned (hard) cider. The metaphorical aspect of it is entirely my fault. The way things have been going lately, anyone would think that Eris had lobbed an apple pie into the middle of the Patheos Pagan channel. There are so many apple and apple pie related posts, it’s hard to keep track of them all. But let’s keep the discussion civil. What Eris teaches us is that sometimes throwing all the pieces up in the air to see where they land is a good thing. It’s very uncomfortable while it’s happening, but it is necessary. At the moment, polytheists are going through a phase of throwing everything up in the air to see where it lands (or perhaps it’s an awkward adolescence). Let’s just take care that it doesn’t land on someone and squash them when the dust settles. Metaphors are sometimes useful. But there’s a difference between a metaphor and an analogy. A metaphor is applicable to a situation but can be interpreted in a number of different ways. A classic metaphor is “My love is like a red red rose” (Robert Burns). If you try to turn this into an analogy, it doesn’t work. 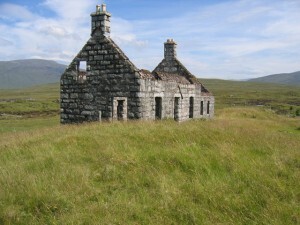 Robert Burns is not saying that his love has thorns and a stem and the petals fall off. He is saying that his love evokes the same feelings as a red rose (beautiful, sensuous, smells nice). So those qualities of the rose are transferable to the experience of his love; the rest of the rose’s attributes are ignored. An analogy is an exact mapping of one thing to another thing. For example, the solar system is often used as an analogy for atoms (it’s not exactly how atoms work, but it’s a good way to teach kids about atoms). The electrons orbit around the nucleus. The planets orbit around the sun. There’s a direct mapping of all the features of the two systems being compared. I see John Beckett’s Bakery of the Gods as a metaphor, not as an analogy. What’s wrong with chocolate cake? I am assuming that in John Beckett’s Bakery of the Gods metaphor, the people selling chocolate cake were Wiccans and Wiccanish Pagans. I like chocolate cake and Wicca. I am not so keen on chocolate cake with not enough chocolate in it, but each to their own. This metaphor, however, implies that you can’t mix Wicca and polytheism (or maybe I am reading too much into it). That’s the problem with vague metaphors, they can mean all sorts of things that may not have been intended. I wouldn’t mix chocolate cake with apples – but you most definitely can mix polytheism and Wicca. If my view of polytheism is different from yours, that’s a good thing – it means that more flavours of polytheism are available; and that’s helpful. Some people like apple pie with cinnamon; others like it with shortcrust pastry, or puff pastry, or less sugary; others still don’t even like apple pie; some people maintain that desserts are bad for you. There are many desserts available, and many flavours of polytheism (none of which are the One True Flavour). None of us know objectively what the nature of the gods is; we only perceive them with our limited, local, and finite perspective. It is interesting to discuss their nature and how we interact with them, so that we can learn from each other’s perspectives. But we can’t be certain what the nature of the gods is. The only way to discover whether one perspective is better than another is by observing its results in the world. If your perspective makes you feel closer to the gods, happy, fulfilled, and able to function effectively as a human being without harming others, then it is probably worth sharing. If your perspective makes you angry, bitter, jealous, and vengeful, then it probably isn’t doing you or anyone else any good. And, here’s the rub: apple pie with cinnamon makes me say “Yuk!” but for someone else, it may be the only way to make apple pie. That’s just fine, as long as I don’t make them eat my recipe, and they don’t make me eat their recipe. John Beckett – The gods are like apples. There are many different varieties of apple (Granny Smith, Bramley, Russet, etc) but they are all apples. They are also distinguishable from oranges. However, deciding where the tree ends and the apple begins – or whether it’s still an apple when you’ve eaten it – is difficult. Eris’s golden apple was inscribed “To the fairest” – and beauty is in the eye of the beholder. In other words, everyone’s experience of the gods is unique. Everyone has a different experience of trees and apples, but what matters is that there are many stories and many perspectives. Various commenters have also pointed out that they are allergic to apple pie, or prefer rhubarb pie, or pear pie, or apple crumble. Did I omit your apple / apple-pie post? Let me know in the comments.